defines this guitar as one of the most significant guitars of John Lennon to be released in the market in the last 30 years. It is further mentioned that John used this particular guitar when the group was nearing the peak of their recording abilities. John Lennon, the iconic musician played the Gretsch 610 model for his well-known song ‘Paperback Writer’. In 1967, he gave this guitar to his cousin David Birch. The guitar was given to Mr. Birch when he visited Lennon at his home in Weybridge, Surrey. He asked Lennon if he had any guitar that he didn’t want because Birch was trying to make his own band with his friends. Media reports state that this model was part of Lennon’s collection of guitars, which he kept in his music room, located at the top of his home. 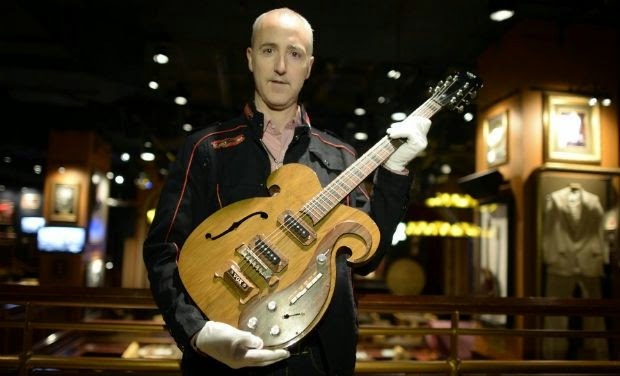 Now, this antique guitar is going to be auctioned and will raise millions of dollars.